So guess what I have my own room and I am under my own mosquito net right this minute. I met with Caroline who wants to start up the Madagascar base this afternoon and had dinner with her and a group this evening. My own room also has a fan! and my own BATHROOM!!! We don't have water at the moment, but having your own bathroom is a very big deal! I am very excited about it. I am beyond exhausted and honestly feel as if I am dreaming. It is just so many sights and sounds and smells to take in at once. Children are all over the place and I want to engage and talk to them and am wishing i could speak Portuguese! and frustrated that I don't. I want to get up at midnight (when I turn 32) and go the the Bethel prayer hut, but I also want to lie down in this bed and sleep. I already know I will have crazy dreams! Good ones I hope. I plan to go through a little visitor orientation with Mark tomorrow on all the do's and don'ts around here. I also plan to meet with the Long Term Staff tomorrow. some keys on this keyboard don't work all the time, i.e. the question mark. so i guess i can no longer self reflect. I want to take advantage of having the laptop and being online, but I also literally just sat down after a very long, busy day. All I can say for now is that I am here, safe and sound and have my own bathroom. There is a roachbug the size of Texas in there right now, but I smooshed him. I drowned him until he swam under the shower curtain and then I stepped on the shower curtain. I will deal with his remains in the morning. Roaches are less scary in the morning. I am just looking forward to settling in here, so anxious to spend time with the kids and may get to go on outreach. There are 90 amazing students here too and I want to spend time with them and hear their stories. Musician Georgian Banov just got here and I can't wait to hear his music and dance with the Mozambicans. I also am anxious to plop my face into the Indian Ocean and delve into her beauty. So, Yvette my thoughts are just that I miss my sister, the one person I miss most all the time and feel like I carry every single place I go. I keep asking myself if I could board that plane for a long, extended stay and not cry my eyes out. I keep wondering what has called me back here so strongly and I am anxious to find out. I feel completely at home and am very excited about getting to get out there and experience, but not today. It is late and I am jetlagged and about to be another year older! I hope Jen will let me use her computer again and I will do my best to blog often and post pictures! Sherri, oh man do I wish you were here!! I am journaling in long hand, but will post highlights here as Jen permits. That is mostly it for now. I am here and safe and sleepy and about to be 32. Much much much more to come. i made it!!!! amber came and helped me pack and laura called and went over packing checklists with me, yvette stopped by to say goodbye and betty picked me up after work. i zipped through the airport and took my seat on the plane. i stopped at the brookstore across from the gate and used one of those massage chairs that massages your calves! we were late departing waiting on luggage and i did not get miraculously seated in first class, but that was okay. i didn't want to waste the calories on bad airplane cuisine anyway. i was seated next to two small blonde children who didn't make a peep except for the little girl gagged twice when she took a bite of her meal and i was about to leap out of my chair, but mother instinct (the same one that gets me excited about being in the HOV lane when i have my nephew in the backseat) crept in and i as able to console her and ask her if she was okay. i had planned to read all these books i had collected for the flight, but wound up watching TV the entire time. betty, they had mad men, season 2, first 4 episodes. about midnight i popped a lunesta and slept fitfully but fairly deeply fo 7 hours! i awoke to more TV, lunch and settled into The Secret Life of Bees (i read the book). but we landed before it was over. i have honestly been on worse flights and was suprised that this one was not as bad as i thought it would be. a girl named brenda was holding a sign with my name on it when i finally made it out the doors of the airport and i am now back at this little lodge where i have been once before. it is ran by this guy named Nepal FROM Nepal...it is cold here!!! but life in Georgia just makes me embrace this unfamiliar chill in the air. i hope i can rest tonight because i really just woke up a few hours ago and am all confused. i figure i can settle into one of my books now and get my last hot shower before my 8:30 departure in the morning. Carla, my heart doesn't know if it could get on a plane for good and leave my punkins, Sherri, i wish you were here more than you could know. we would be sitting by this lame little fire, eating french fries and laughing. betty, thank you for braving the airport just for me. i hope you got home! christine, you are coming on the next trip!! yvette, i will do my best on footage. jen habicht, wish you could come swim in the atlantic with me. i best go. i could write pages. i am safe. hope to sleep well and will be in PEMBA tomorrow at 1:00!!!!!!! Ahhh. The day of my departure is here. I leave tonight, fly for 17 hours, and arrive in Johannesburg at 5:10pm on Thursday. I am staying at the little lodge where I stayed two years ago when I missed my flight to London. It is a quaint little inn with comfy beds, hot water and a warm meal. Two years ago, they had a computer with dial-up so I am sure I will be able to post my arrival. I will leave the next morning for Pemba, stopping in Maputo and arriving in Pemba that afternoon. I already have a scheduled "meeting" with Caroline, the Madagascar missionary that day. I work from home today and that is a huge blessing. I have the morning to pack and can run to the bank during my lunch hour. Mama Betty Conner is coming over after work to take me to the airport and is bringing bathroom scales to weigh my luggage. I vowed I would travel light, but that didn't happen. My bags are full of gifts and goodies. I could not be more ready to go! The trip has been a long time coming and I am at total peace, elated to be going back and excited to see what the future brings as a result of this trip. I plan to blog as often as possible and post pictures and keep it interesting, raw and unedited. Four years ago, in the South of Mozambique, one of our African youths shared his dream to see Mozambican worship music change the world. At the time, no resources were available for that music to be distributed, but his vision reached far beyond the present circumstances. Last year, that same young man was part of a pilot project in Pemba, Mozambique that captured some of the raw, Makua-language sounds in an original music CD, "Voice of the One." Armed with new recording equipment, made available through a number of generous special donations, we are back this summer recording an all-new, full-length album of Makua songs. We hope they will influence the culture here and abroad for the Kingdom, and that they will prove to be the first fruits of far more indigenous and heavenly art to come. What does love look like for a widow in an old house? This week love looks like a new roof before the rainy season. Some of our local Mozambican Bible students and pastors helped us find the oldest and poorest widows in Pemba so that we could demonstrate the love of the father for them in a very tangible and real way. Our team of Mozambicans and Harvest School students arrived to find a roof so full of rifts and ruptures that it couldn't really be described as shelter. As we tore the old covering off, it crumbled in our hands, brittle from years of sun and rain. Several generations of women were living in the house- the eldest celebrated with a bright toothless smile. The project attracted neighborhood kids so we split our team- half of us in the dirt dancing and playing with the kids. The Makua widow and I taught the kids a song, proclaiming that no matter where you look you won't find anyone like Jesus. And to top it all off, just a few dollars bought bread for all the kids! The message of the gospel is clear: love is not just an ideal, it is action in reality, in spirit, and in truth. How good it is to be with the poor and to pour out simple, practical love. We'll continue to repair roofs for the next five weeks as often as funds allow. Last Thursday, in true Iris fashion, teams of mission school students, Bible college students, missionaries, and visitors poured into a small flock of Land Rovers, venturing out into the Mozambican bush to wreak havoc on the enemy and see the kingdom of God advance! In the district of Churie, God healed many of the sick on the first night, including three deaf people who had their ears opened up! God's presence fell heavily during the worship service the next morning, and afterwards we walked through the village to the local watering hole for an incredible baptism time. Throughout our stay, the Makua and Iris team members remained full of joy and energy. Before we left, the local family of another faith who had allowed us to camp on their land accepted Jesus also.It seems none of our trips is without certain amusing difficulties, of course. On this trip we lacked the large open-backed truck that we normally used for a stage. Without it, our Harvest School and Mozambican Bible School students struggled gamely through a prepared drama, but without any boundaries to the play's action. The effect was hilariously chaotic, as the crowds intermingled closely with and around our actors in their excitement. The sound system had to be cranked up to amplify the actor's sounds over the close-in crowd's noise; the result was loud, messy... and ultimately beautiful nonetheless.Heidi received a very generous offering from this village: one fully-grown, live goat, which provided ample sound effects of its own during our return trip as it rode proudly on top of our Land Rover down the dusty road home. We gladly report that he is now safely settled at our Mieze children's home, with a ever-growing family of fellow goats for company.One of the most moving parts of the trip happened when a Makua grandmother brought us a beautiful albino orphan named Mariette. 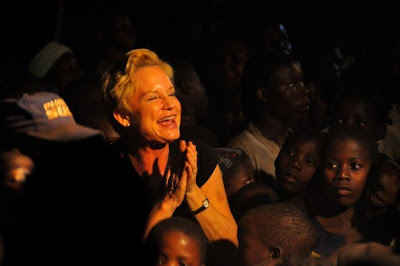 Albino children are difficult to care for in the villages, as their skin and eyes require special protection in the hot, sunny subtropical climate. We are now working with officials there to bring this precious baby to Pemba. There is great need for a new children's home in Churie, as there are 48 orphans in the one village we visited alone. We are in the process of building a hut there, and we continue to believe God for His increasing provision as we take in every orphan we can find, both here and from all over the country.Birthday CelebrationsYesterday we celebrated birthdays for all of our children born in June! For each child, a birthday is more than just a fun day, but a reminder of being adopted into a family. They are no longer orphans who don't have names or birthdays. Our heart is for them to feel a special and renewed sense of belonging at each one of these festivities. The celebration was held on the serene Wimbe Beach, and the kids had an incredible time. One of our missionaries, Yonnie, is in charge of the "ministry of fun" - a great priority here at Iris. She had the kids split into teams, and we held relay races up and down the beach. Though competing in teams, everyone was just happy to be out having fun, with no concept of prize-winning in evidence. After team "Alegria" won the last relay, all of the kids from different teams erupted into dancing and singing. They are so thrilled to be a family and to be having fun; there is no room for jealousy! When it came time to pass out the gifts, everyone began with praising and thanking God... and, of course, dancing! Each kid who had a birthday was called into the circle and given a gift bag with toys, and a new outfit. A few other children and missionaries gathered around and prayed a prayer of blessing over each child as they received their gifts. Afterwards, kids and adults dined eagerly on some much-prized cake. Anything sweet is a highly anticipated treat in Pemba! The children look forward to these celebrations once a month. Each child recognizes and understands God's provision, and is so thankful to be adopted and surrounded by people who love and support them. We would like to thank our supporters around the world once again for making all of this possible. You are all present with us in spirit, and we thank God for you daily. Blessings and peace, from all our family here at Iris Ministries.